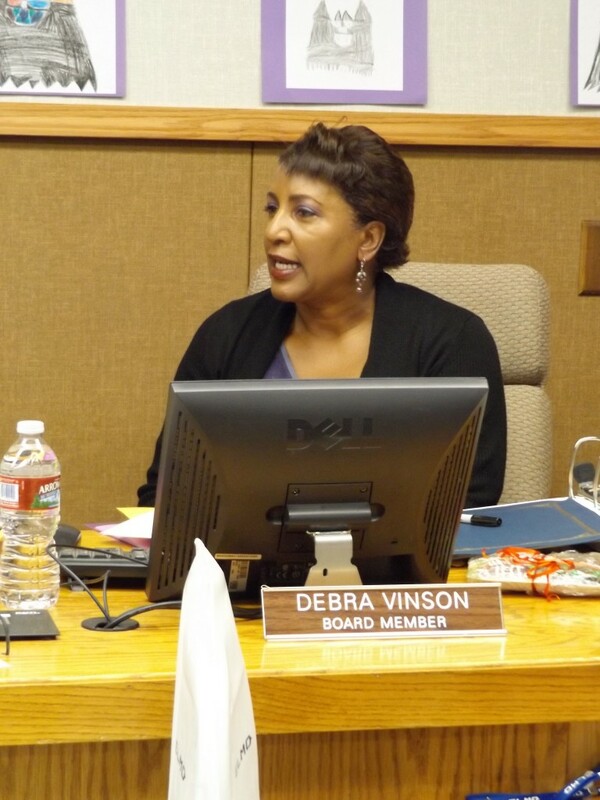 Antioch School Board Trustee Debra Vinson. Herald file photo. Many items – over three dozen in fact – were covered during the Wednesday, Dec. 13 meeting of the Antioch Unified School District Board of Education. But one of paramount focus, importance and contention was the election of the President and Vice President of the Board. It resulted in a contentious, split vote of 3-2, with the board majority bypassing Vice President Debra Vinson and instead electing Trustee Gary Hack as the new President of the Board for the coming year. However, Trustee Crystal Sawyer-White, the top vote-getter in last year’s election was elected Vice President on a unanimous, 5-0 vote. New AUSD Board President Gary Hack. Photo from AUSD website. Gibson-Gray went on to nominate Trustee Gary Hack, citing his experience and the fact that he has served as Vice President but never President. President Walter Ruehlig seconded her motion, but the item was opened to public comment before they could vote on the nomination. The speakers were supposed to speak before the board when the item was first brought up, but were skipped initially due to a clerical error. Jeff Belle, Contra Costa County Board of Education trustee and Vice President, spoke first, about history, precedent and inclusion. “History has been very kind to us, and also has been very unkind to a lot of us in different ways,” he began. “Do keep in mind that history is very important in terms of precedent… tonight, just for the record, the Contra Costa County Board of Education voted two African-Americans to lead as President and Vice President.” According to Belle, the vote he described marks the first time the Contra Costa County Board of Education has appointed an African-American to either of those positions. The focus then shifted back to the board’s own internal discussion, in which Trustee Crystal Sawyer-White stated she was “not in agreement with the motion” of Hack’s nomination, and motioned to postpone the election, expressing her agreement with the public commenters and support for electing Vice President Debra Vinson to the presidency. Vinson spoke next, explaining a “system” that has been followed for some time in the district in which the current Vice President, if they have not previously served as President, is elected ceremonially to give them the opportunity to serve. The board’s deliberation was interrupted by one final public commenter, Odessa L., who questioned “why would we change the direction of things we’ve always done in the past” in regards to Gibson-Gray not nominating the sitting Vice President. “I was going to do that, and I’d be happy to do that,” Gibson-Gray responded immediately after discussions shifted back to the board. “In the history of Antioch… for as far back as I remember when I lived here, we’ve never had a censured Vice President,” Gibson-Gray explained. While there is a ‘system’ in place to nominate the sitting Vice President for the position of President automatically, Vinson is a unique situation, having been formally censured by a majority of the board earlier this year “for allegations of bullying and intimidating staff members” according to a Herald article from earlier this year. Vinson is an elected official, not a hired district employee, and thus according to Sawyer-White’s research and claims, “the [censure] is non-valid… based on the board by-laws… she cannot be censured.” Sawyer-White also pointed out that Gibson-Gray’s comment of ‘perhaps next year’ is null and void as this is Vinson’s last year serving on the Board. “What is your reason, aside from the censure-ship, that [Vinson] is not qualified for this position?” Sawyer-White asked Gibson-Gray. “I feel that trustee Hack would be a better President,” Gibson-Gray began. “The censure is a big one for me.” She paused briefly before going on to accuse Vinson of calling her “racist” and of being “not nice to staff”, stating that the board needs “a year to heal” with Hack as president. “I need to respond, I’m sorry, I can’t leave those comments out like that,” Vinson said, overstepping President Ruehlig’s attempt to call a vote on the motion of nominating Hack. Vinson pointed out that Gibson-Gray denied several of Vinson’s invitations to get coffee, which Vinson hoped to use as opportunities to pass along that information to Gibson-Gray. Vinson also alleged that Gibson-Gray previously pledged to support Vinson when it was her “time” to be president. “It’s pretty clear that you’re not ready to keep your word based on false information of a censure,” Vinson stated. “This is not a game, this is about our children’s lives, this is about what’s at stake for the staff, and this is about practicing what we say we’re going to do to make this district a really positive and open district… it’s unfortunate that you’ve made it personal.” Vinson re-extended her invitation to coffee in hopes of working out some of her and Gibson-Gray’s apparent issues, noting that she’s only had coffee with one member, and went over some of her qualifications for the presidency and agreed with Sawyer-White’s notion that a lawsuit might be brewing. “I really think that I am next in line to be Board President,” she stated in conclusion. “And I really would like to see this board follow through on that action. The board eventually voted Hack to the presidency with a 3-2 vote, with Gibson-Gray, Ruehlig and Hack himself voting yes and Vinson and Sawyer-White voting no. Encouraged by Hack and Vinson, Sawyer-White made a brief statement before accepting the nomination. Sawyer-White pledged to be the “best leader [she] can be” and was elected by a 5-0 vote. “Although I’m disappointed that this board failed to make an equitable decision, I will congratulate trustee Hack and trustee Sawyer-White,” Vinson commented. Ruehlig expressed a genuine desire for Vinson to be president next year, but Vinson restated that she will not be in office next year. This entry was posted on Thursday, December 14th, 2017 at 8:08 am and is filed under News, Education. You can follow any responses to this entry through the RSS 2.0 feed. You can leave a response, or trackback from your own site. This is Jerry Springer material in Antioch. Liars, frauds, and bullies. Of course we can’t forget the race card!